Build, buy, borrow or steal. It doesn’t matter how you get one. If you have little ones then kids outdoor playhouses are a must. It’s amazing how one simple structure or toy can provide so many hours, days or even years of fun for your kids. A playhouse in the backyard will provide the base for thousands of different role playing and imaginative games. It is a must for your child’s development in so many ways. Healthy role play and the building of interactive skills are just the beginning of how certain types of play contribute to a child’s growth. As they mature, the games that they play and the role of the playhouse will grow with them. Plus, if you get a really cool one then your backyard will be the go to place for your kids and all of their friends. 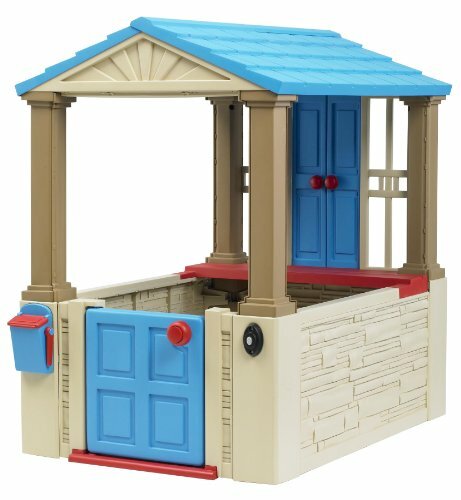 This multi purpose playhouse comes with an open design with a working door, mailbox and multiple play stations. The pretend kitchen station has a stove, sink and working clicking knobs. It is recommended for children 18 months to 5 years of age and is made in the USA. This innovative design allows your kids to assemble and disassemble the fence whenever they like. Playhouses encourage role play, physical play and social interaction. 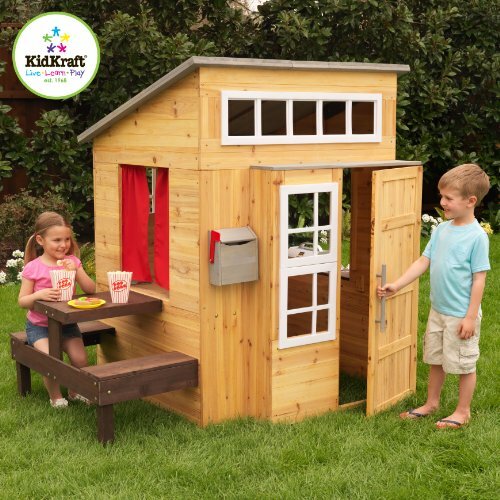 The Kidcraft Outdoor Playhouse is for ages 2 years and up and does require some assembly. It is designed so that multiple children can play in it at the same time. 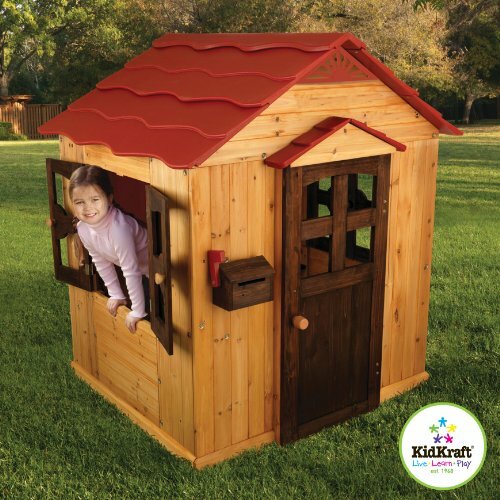 It is made of sturdy weather resistant wood and a red plastic roof and is built to last. It includes easy to read instructions and labeled parts for assembly. The door and windows open and close and the inside of the house includes a toy sink with the realistic features of hot and cold handles. 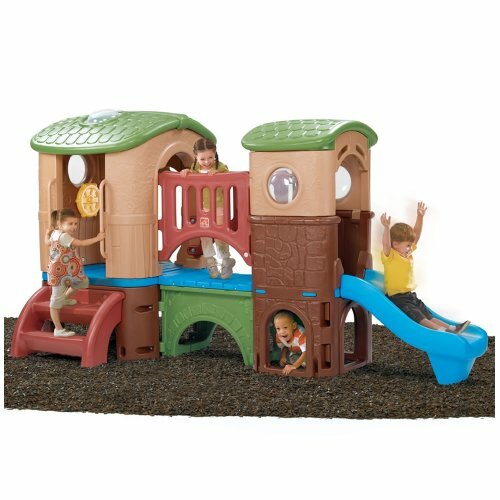 The Clubhouse Climber is truly a multi use playhouse for ages 2-6 years. Perfect for your kids and all of their friends to hang out in all summer. This one comes complete with climbing, dual slides, a lookout tunnel, steering wheel, a bridge with railings, windows and a skylight. It is a safe and fun backyard toy for your energetic kids. 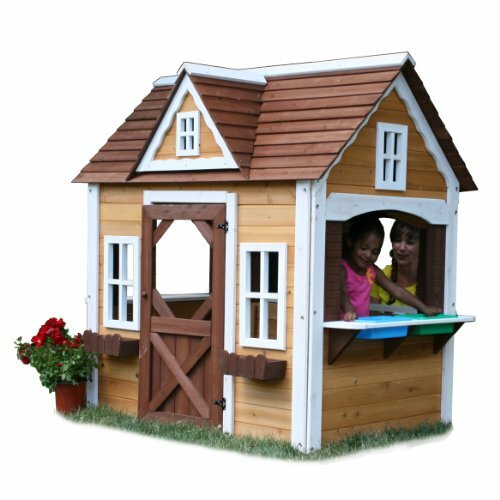 This colorful playhouse is ideal for any child over 18 months. It has some fun features like a working doorbell, mailbox with flag and a table top. It is for indoor and outdoor use and fits through standard 36″ doorways for easy moves from room to room. Simple, basic fun and imagination for your child’s first playhouse. This outdoor playhouse has reinforced wooden panels to prevent warping and weathering and is water resistant. The unique design features an expresso colored picnic table and two benches attached to the side. It has a mailbox and the door swings open and closed. There is even an outdoor grill with removable lid. Ages 36 months and up. This wooden playhouse needs to be assembled. It comes with all pre-cut, pre-stained lumber and hardware included along with fully illustrated instructions. The wooden roof has windows for additional indoor light. 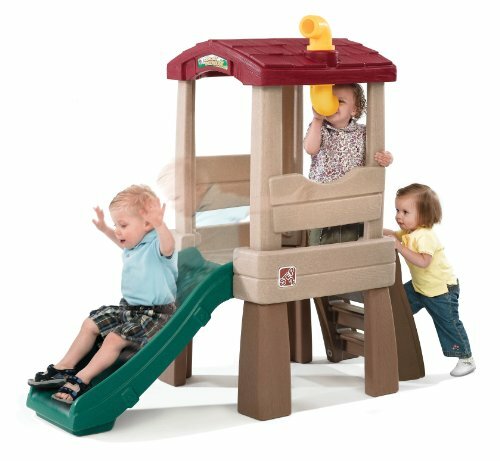 Walk up to a platform and enter the playhouse, when you want to leave use the slide for even more fun. This backyard playhouse is unique and will make you the most popular place on the block for all the kids. 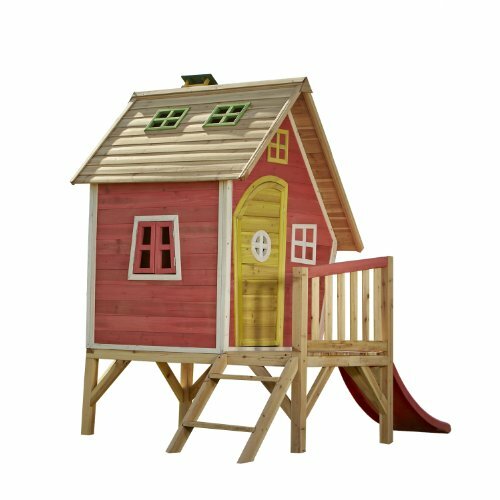 This playhouse is made by Swing-N-Slide and the kit comes with pre-cut, premium stained lumber, all decorative elements and easy to read and follow plans with illustrations. 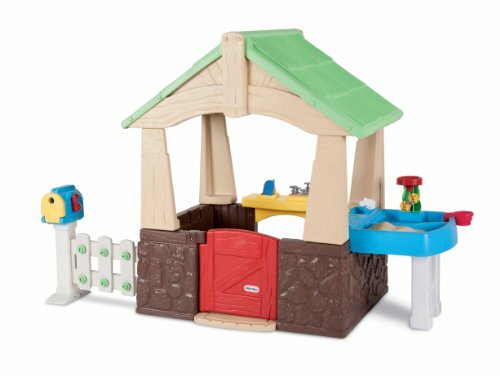 Hours of imaginative play and fun in this spacious playhouse with full size door, window openings and 2 wooden flower boxes for realistic look and feel. 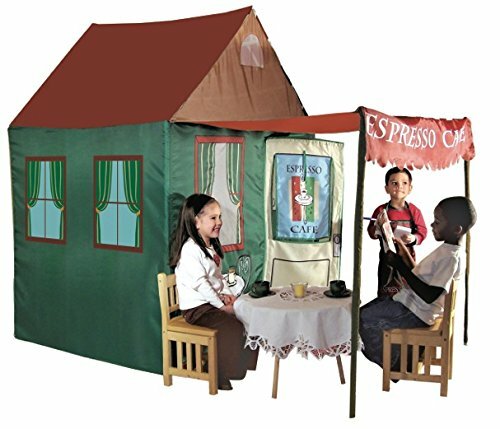 This playhouse tent is made for easy storage and portability. 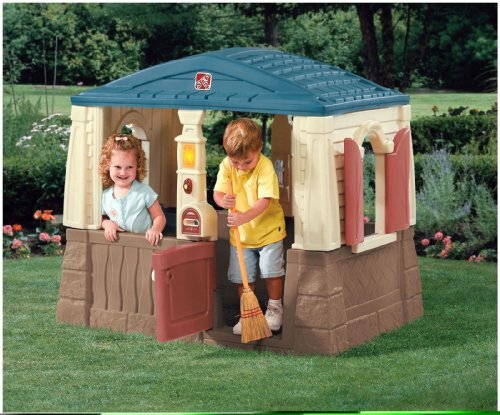 It is a 7 foot playhouse with a large awning and a door with a roll up window. It includes a carrying case and is meant for ages 3 and older. Great for a playhouse that is for indoor and outdoor use. This is the perfect playhouse for toddlers. The molded in floor keeps kids out of the dirt and it can be used for indoor and outdoor play. The open concept design lets parents watch the children while they are playing inside. It comes equipped with a built in kitchen table, faucet, burner and two seats. Adult assembly is required. This affordable unit is a fun and sturdy treehouse for ages 18 months and up. It has a shingled roof on the platform for protection and shade on those hot summer days. Climb up, play on the platform with the built in periscope and then have fun sliding down. The perfect play combo.